The Official Blinds Online Store. Grab Your Ruler and Measure Your Windows NOW! Our APRIL SALES are on NOW. Take 10% OFF Wood Cornices, Faux Wood Blinds and Plantation Shutters with BlindsOnline coupon codes! Sales end 4/30/2019. Select from our popular economy blackout shades, faux wood blinds or vertical blinds. Our soft roman shades are a great set of shades to compliment our wood cornice valances. We have styles and colors to compliment any decor. Read our customer reviews and be confident in your Blinds Online order will be made to your specifications and delivered to your door. 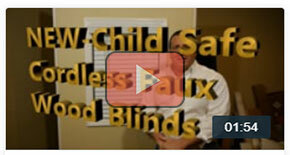 Check out our NEW Cordless Faux Wood Blinds that are certified Child Safe. You can easily install your DIY blinds and shades by watching the videos on every window shade and blinds pages. Made to measure means that your window coverings will be made to perfectly suit your windows. If you have questions or need help ordering, don't hesitate to call our customer service specialists toll free 866-811-7727. We accept All major credit cards, PayPal and Amazon Payments. At Blinds Online, we don't like using the phrase "cheap blinds." The blinds that we offer pass rigorous quality controls and are manufactured in the United States. We know people are looking to save money on their window treatments and ordering the cheapest blinds you can find online may be one way to save some money. However, we do not offer cheap blinds. The blinds we carry are at wholesale prices because of our relationships with our manufacturing facilities. We are able to get discount blinds at a better price and we pass on the savings to you. So instead of buying cheap blinds or discount blinds from other stores, who may import their products, try getting high-quality, affordable blinds at wholesale prices from us. With our guarantee, we can bet that you won't be disappointed. 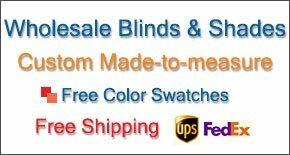 Be sure to take advantage of our promotional code for even deeper discount blinds!